My “Wild Ducks,” a braided memoir, appears in River Teeth. 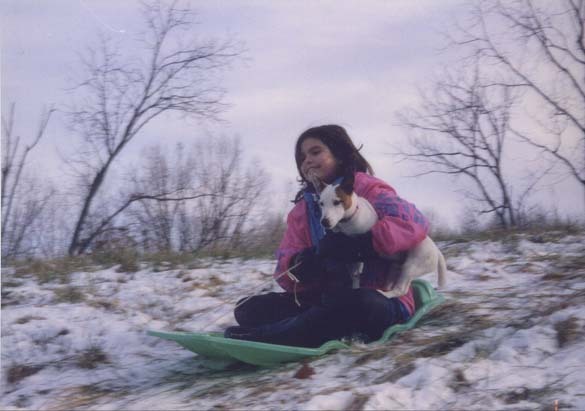 My daughter Claire, at eleven, sledding with her puppy Jack, another player in the essay. The past few years, working on my memoir of farming in Appalachia, I’ve generated tons of material—twice, 500 pages—and have spun some passages into stand-alone pieces. The published ones include an essay on my hired hand who died; another about a legendary pond-builder with a tragic secret; one about the historic first meeting of my future wife and my father; yet another about my father’s return to farming in retirement and his decline and death. Claire and Tom and I watched the ducklings hatch. Wriggling like wet seals from the rocks, they emerged from their brittle cocoons. These were some sweet ducklings—literally: they smelled like maple syrup. I’d misted the eggs daily with water during incubation, using a recycled syrup bottle as a makeshift sprayer, and the incubator’s warmth had reconstituted a residue. The sugary scent had passed through the eggshells and coated the ducklings. All seven hatched, and when the black-and-yellow brood huddled in our children’s laps, the room filled with the smell of Sunday morning flapjacks. Tom, nine, sits cross-legged and tries to smile, his mouth pressed into a downward line that bunches his pink cheeks. He wears a blue tee shirt with white bands, and he must have been in a growth spurt because his canvas pants ride up his legs. Tom scratches at his neck with his left hand—he’s bothered by his long hair, which forms a dark blond helmet on his head and hangs down his neck and in his eyes. His little face peers out as if from under a haystack. Our Saturday barbershop ritual has dissolved here, a casualty of house construction and farm busyness and new school routines and the unpredictable weekend hours of Appalachian barbers. When I waved the kids into place that day for their portrait with a lamb, I wanted to capture a culmination, and I suppose I did. But now I can’t look at the photograph in its cherry frame on my desk without glimpsing what I couldn’t quite see and didn’t yet know. Editors I sent that essay to, the first version of “Wild Ducks,” schooled me with rejections. Apparently it didn’t work. And yet some of the rejections, weirdly for that genre, were complimentary and encouraging. I concluded the passages were fine but needed unifying, needed something more. I hadn’t a clue what, so I put the piece aside. Then one morning the summer before last, as I was slaving away on a rewrite of the memoir, I began to tell a new story, about when my wife, Kathy, and I took Claire off to college in Chicago. The account, or much of it, was played for humor. How Claire was angered by our overbearing emotion; how my wife and I melted down differently, and at different times, locations, and rates, as we sent our first born over that threshold of adulthood; how I lost the ability to walk after our farewell restaurant meal—an allergic reaction to MSG—and how Kathy, lost in her own grief, ignored my crisis in our motel room. I had it! The through-story. The foreground thread I needed to hang the baubles upon. It would be a braided essay, a structure I’d grown fond of unto obsession. 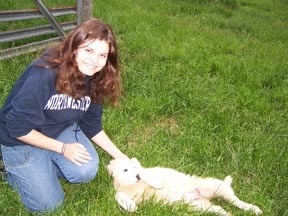 College girl: Claire pets our new sheep guardian puppy. Braiding is just telling two stories (or more: see my post on how “Our Secret” by Susan Griffin employs three) by alternating between one in the foreground and one unspooling farther in the past. The structure is used in so many novels, narrative nonfiction accounts, memoirs, and movies because it works. A great example is Sean Penn’s movie based on Jon Krakauer’s Into the Wild. The foreground story starts with the protagonist, Christopher McCandless, establishing his camp in the Alaskan bush; the movie alternates with scenes of the people he met on the way to getting there. The backstory is incredibly moving because even though we know where he ended up it shows how and why, and because we watch him turn his back repeatedly on love and hearth in favor of the spiritually purifying quest we’re watching, in the foreground story, slowly kill him. In fact, the backstory is more compelling than the wilderness thread, even though we know it’s “over,” in the past, because it’s populated with people and complex emotions. Outside Claire’s dormitory we perch on a bench in a patio’s nook. Coneflowers hang in the warm air around us like pink shuttlecocks; a fat bumblebee clings to the brown button eye of one wavering blossom. Kathy reviews the use of debit cards and fumbles a speech about making the most of one’s college years. Claire glances toward her stone dormitory. “Kathy,” I say, “if we don’t leave, she can’t miss us.” I hug Claire, then Kathy does, holding on longer. She pats Claire’s shoulder. “Call us she says,” turning away as her face swells with emotion. She’s looking in her purse for a tissue. Claire stares at Kathy’s lowered head and throws out her arms in theatrical frustration. Parental emotion, especially her mother’s, is too heavy to lug into her new life. 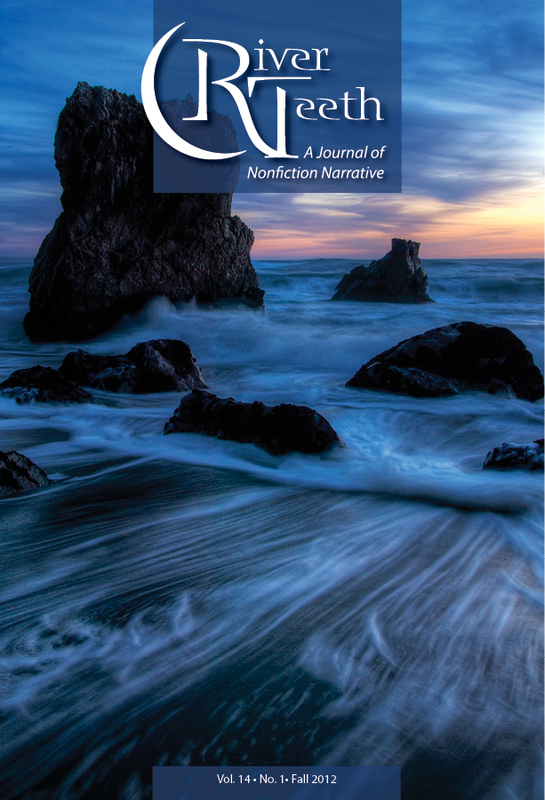 I’d forgotten I’d sent “Wild Ducks” to River Teeth: A Journal of Nonfiction Narrative—they’d had it for about nine months—and when one of the editors, Joe Mackall, called me I was stunned. “It’s like E.B. White meets . . .” and he named two other writers, but I was too flummoxed to follow. “Regret runs like a thread through it,” he added. Or something. I was babbling my thanks. Writer friends had worked me over for “Wild Ducks” good and hard since I’d sent it off so happily to River Teeth. One felt it wasn’t reflective enough, and she had a point—but now it was too late for a major recasting, just some tweaking. Another said I acted like a “big baby” in the MSG scene; but I’d inflicted the whole manuscript on her, and since she didn’t like my anxious persona, that scene late in the book of my flopping around and bleating for help apparently was the last straw. I disagreed: I couldn’t walk and was truly alarmed, plus I was playing the scene for humor. But I felt another scene, since cut from the book, where I tease Kathy seemed puerile. It was, however, an accurate depiction of my sometimes childish sense of humor. Truth in nonfiction! Anyway, I’m thrilled to be in River Teeth. My fellow contributors include two writers I admire: author of The House of Sand and Fog Andre Dubus III, who writes about his surprise and vulnerability when he was confronted by people pained by his perceptions or by their family secrets being aired in his gripping and gritty memoir, Townie; and Lee Martin, novelist and memoirist, recently interviewed on this blog, who in “Selling Out in the Writing of Memoir” likewise explores hurting peoples’ feelings. My own second-guessing aside, I’m mostly pleased with my essay, now available on Scribd, where I’ve posted some other memoir excerpts, even if neither Kathy nor Claire can bear to read it. For better or worse, a writer comes to regard with a cooler eye his raw material—the upsetting event, the nagging memory, the painful emotion—that he shapes into story. And he assumes the narrative’s other actors share his clinical view. They don’t; they can’t. My experience was not theirs, yet it triggers and perhaps threatens theirs. I’m glad I memorialized that trip we took years ago with Claire. I made meaning from it, distilled something clear and hard from the murk of memory. And now I also have that day when I finally figured out, with a yelp of joy, how to tell the story. Yes, Richard, congratulations! You seem to have a handle not only on fiction, which I have written about and received a number of good and thoughtful responses from you about, but you are gradually teaching me about a lot of things to do with essays, memoirs, and how to appreciate them. I’d never heard the term “braided essay” before, and am really grateful for your explanations and teaching. Thank you, Victoria. I wonder if all the foment in nonfiction over structure has to do with the fact that in nonfiction you’re more locked into point of view, which seems to be fiction writers’ obsession? What an insightful article – thank you Richard! And congrats on the River Teeth publication. What I admire most, Richard, is your incredible persistence and faith in yourself. Congratulations on the publication! That’s awesome. I love what you have to say about the whole process of the piece and that quote by Heather Sellers. This may be my favorite post of yours. Thanks Debra and Cynthia. It took a long time to find that essay’s form and its home. Dclaud, it was just stubbornness that caused my persistence. Or maybe just that I was working on a larger project and could set the essay aside. Congratulations! I’m going to have to pick up that issue. I’m in need of some new essay inspiration. I like how you categorize Into the Wild. I’ve long pondered why that story is so captivating even though we know the ending. What you say makes sense. I’m working on a narrative project and now I think a braided approach would be perfect. Rachael, it fascinates me too why we care, and get worried and feel suspense, when we know what happens to Chris. I think it is learning the details, the how, the backstory we crave. All day we are around people who trail stories we’ll never know. The other thing this issue underscores is really a question: what to reveal and what to withhold until X. Annie Dillard offers one guideline—get the major trauma out front, don’t spring such things on the reader—but narrative withholding that pleases readers can reside in smaller details, such as Chris’s turning points within the backstory. I just reread Darin Strauss’s great memoir Half a Life, about his accidentally killing a classmate, which happens in the first couple of pages, but then as the story unfolds there are surprises left where they occur instead of being summarized or given away because the writer “now” knows the story. Good point about Strauss’ book–now that I look back on it, that’s exactly how it unfolded. I’m the same way when I read or watch The Perfect Storm. For me, there’s an element of hoping it will turn out differently. Or more accurately, trying to figure out what these people may have done differently to avoid tragedy. Wow! Congratulations, Richard, on your publication in River Teeth. I’ll definitely be buying a copy. And I’m sending a link to this blog to my memoir students, whose assignment last spring was to write…a braided essay! Hey, Susan. So glad you are teaching that structure. Tell us sometime how they did. I love these posts about your family and about your amazing persistence in the search for how to braid multiple stories. My draft is almost entirely one story right now. I’m hoping that drafting my epilogue will give me a through story and that I can manage a fraction of your artfulness in the telling. Thanks again for teaching as you learn. And congrats on the published essay!! Your final memoir is going to be amazing. And I admire the clarity and sense in your process, Shirley. Every story is so different of course that one person’s answer may not be yours. Also, I saw much of my book’s structural needs so very late—and I’m a slow learner anyway—that I feel much of my blog is simply a record of my mistakes. Sometimes I think my purpose is to serve as one of those people who’s an example to others of what not to do! I’ll be buying a copy, too, Richard. Love your excerpts, honesty, and beautiful writing. I like this image of braiding. I write a lot of personal essays and my last book is a memoir, so I’ve had to think a lot about this as well. The basic challenge of all personal writing is making it detailed enough to be interesting but universal enough to be relatable. If you tip too far in either direction, you’re lost and so is your reader. Wow, your last two sentences are themselves a whole book. You have really crystallized the issue. This kind of applies too to the issue I raised above with Rachael, which is how and when to reveal certain things. Congratulations, Richard. The piece about the ducks is lovely (can’t get the maple syrup out of my mind). Thank you for sharing how it took time for you to find the threads of the story and how you wove it all together. I’m looking forward to reading the full piece! Congratulations Richard. My favorite part is the comedic scene of the dual meltdowns. You are a trailblazer in revealing the baby in all us men – and it is attitudes like like that woman that keep it closeted – for them! Really love the piece. River Teeth! That’s amazing… congratulations. And being compared to E.B. White is like some kind of literary dream… I don’t know how you managed to keep from sobbing with the joyful weight of it all. Braiding… it’s a great technique. Can’t wait to read more of your work. Congratulations, Richard! The cover of the River Teeth volume is stunning. And a thanks for the instruction you braid into your own writing experiences here at your blog. Congratulations, Richard. What wonderful glimpses into your life. I loved the mallard hatching. It made up for the chicken hatching I tried as a boy, but never had. But that’s another story. Congratulations, Richard. River Teeth is one of the best. I appreciate, too, being able to read Wild Ducks on Scribd. I chuckled about your boyish defense of Doty the “miracle” dog, and your self-deprecating assurance about losing money on the sheep sales. The braiding of wild ducks leaving the nest with successfully launched young people is a marvel. There is a poignant sense of movement in this essay, with its subtext of aging, that moves me deeply. Thank you, Beth. I envy you that yoga instructor, a wise one. Yoga at its best is the most spiritual practice I know. What’s so effective about your beautiful essay is the sudden lurch from the college story into the Hoagland-like scene of your discovery of the duck eggs, which among other pleasures gives the reader the “ah-ha” thrill of linking the title to the two disparate stories. I especially admire the way you stick with the duck story as long as you do before making any attempt to link it to the opening beat of the essay. One of the great virtues (and challenges) of the essay form, I think, is its ability to squeeze meaning from apparently disconnected events and ideas. A bit like a crossword puzzle, perhaps. As a fellow contributor to the same issue of River Teeth, I’m honored to be in your company.. Thank you, Leslie. I’ve since read your essay, “The Things Our Fathers Loved,” and enjoyed it immensely. It is impressive how much you weave in, and how much I find resonant in the image and reality of pianos moving through families with the years. (I’ll have to ask my sister what happened to ours.) It is somewhat startling how much I identify with your portraits of parents and elders, which makes me realize how common are the human joys and pains; I really appreciate your light touch, too, in conveying just enough to sustain your story and to set my own memories in motion. I just read the essay through Scrib’d. So beautifully written on so many levels — the language, the honesty of emotion, the skillful braiding. The line about watching the ducks fly away and taking a piece of your heart with them (how that should have prepared you – but of course, didn’t- for one of your own brood leaving) just pulled everything you had been writing about into one stream that flowed directly into my heart. In that moment, I felt the loss and the longing, the difficulty of letting a child go off into the wild world. You must be so proud – it all works so well. Lovely. Jan, thank you. It was neat for me when the two strands really came together there, not planned but as if inevitable. A lovely essay, Richard. If I were editing FATHERING DAUGHTERS again, I’d insist on including it.